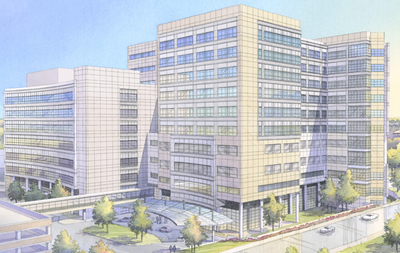 The C. S. Mott Children’s and Women’s Hospitals Replacement Project (C&W) was approved for bid and award by the Regents at the November 2006 meeting, and included shelled space to provide for future expansion opportunities. The C&W project will consist of 1,100,000 gross square feet with a clinic building of nine floors and an inpatient building of twelve floors, plus penthouses for mechanical equipment. The project is currently under construction and proceeding on schedule for completion in Spring 2011. Since the project was approved, demand for patient care services has increased beyond expectations. This project will complete 151,000 square feet, the majority of the shelled space, leaving a limited amount of shelled space for future program needs. The project includes the completion of 84 patient rooms, clinic and office space.